Sometimes I see the ads are more entertaining than the program itself. We all have our own favorite commercials. In these several years, we have seen innumerable ads. Some really stick with us, years after they've been off the air. Some others are memorable for totally different reasons or simply lost in the passage of time. But can we imagine a world without ads? It would be so blah, isn't it? I rubbed the Aladdin lamp for some quirky ideas, the genie smirked at me..
Wow that was one such innovative idea. 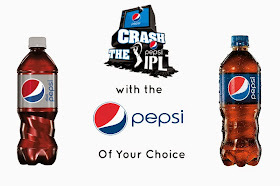 Of course, I'd love to make my own ad to crash the IPL with Pepsi. 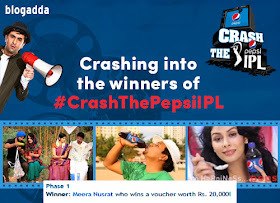 Tags: I am joining in on all the Pepsi IPL action in my own style with the #CrashThePepsiIPL activity at BlogAdda. Get Famous: This Pepsi IPL, it’s not just about cricket. It’s time to crash with your own created ad! Make your own Pepsi ad & if it’s chosen, it could play on TV during Pepsi IPL! And hey, it doesn’t end here… Even if you’re chosen as a finalist, you stand a chance of winning a prize amount of Rs.1 lakh! So what are you waiting for guys? Hmm.. Interesting screenplay for the #CrashThePepsiIPL Ad. Loved the narrative. I'd definitely like to sign you for the ad if I were shooting it!!! This is an absolute cracker! What a creative post, and practical too! You are one creative rat!! All the best! !